31st December 2014 – Moses Kipsiro (UGA) and Mike Kigen (KEN) rounded out 2014 in the best way possible by taking victory in two of the most traditional New Years Eve races. 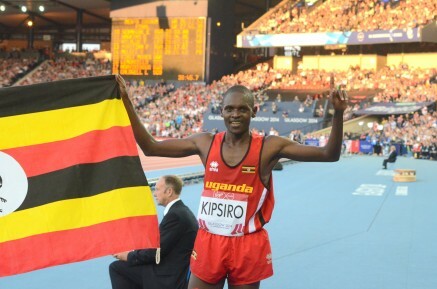 As it marked its 25th year, Kipsiro became the most successful athlete in the history of the Trier New Year 8km race by taking his fifth victory. In front of an estimated 15,000 spectators who lined the route he had to work hard for the victory as she was just 2 seconds ahead of runner up Tegen Hailemariam-Amare. Kipsiro clocking 23:05. However Kipsiro was delighted with the win and hopes it signals the end of an injury plagued few months. At the 50th edition of the San Silvestre Vallecana in Madrid, Mike Kigen gave a dominant display pushing the pace right from the start. Passing halfway in 13:37 he was already running on his own and only continued to build his lead until crossing the line in 27:51. This capped a great end to 2014 for Kigen after his second place finishes in both the Great North Run and Frankfurt Marathon. 3 days earlier at the Corrida Pedestre International de Houilles, Micah Kogo (KEN) unfortunately wasn’t able to add to his list of victories. A 3 times winner at this event he had to settle for eigthth place on this occasion. Mark Kiptoo (KEN) was able to make the podium as he showed pace up the finishing straight the defied his 38 years of age and marathon pedigree to take third. After his solid outing at the European Cross-Country Championships, Tom Lancashire (GBR) was 17th.